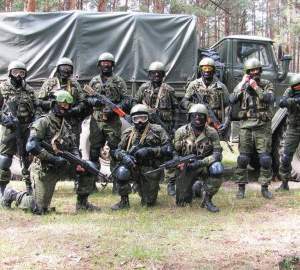 Meanwhile, the weapons and training Minsk gives its army show little in common with how Moscow develops its military. The Belarusian government is making its army ever smaller and getting rid of most of its expensive, heavy weapons necessary for all out offensive operations. Minsk usually buys major arms systems from Russia. This year, Belarusian defence ministry official media reported that Belarus had received six Mi-8MTV-5 helicopters and a division of Tor-M2 surface-to-air missile systems from Russia. Less costly—yet still important—purchases from Russia include the 2017-produced RPO-A Shmel, an infantry flamethrower that the Belarusian army already uses, and its modernised version, the Shmel–M, bought for the first time. Minsk has also signed contracts on purchasing 12 Su-30SM aircraft and some Protivnik–GE radars from Russia. National arms industries are supplying the Belarusian army more and more equipment, too. A key new piece of equipment is the Palanez, Belarusian multiple-launch rocket system. At the end of October, an improved version, the Palanez–M, was successfully tested at a distance of more than 300km for the first time. The Belarusian military is also planning to continue purchases of communication, navigation, and surveillance means, armoured vehicles, small firearms and body armour. Some of this equipment will be from Belarus’s defence industries (see Table one below). Minsk also plans to buy over 50 drones, which are mostly Belarus–manufactured, and to continue modernisation of T-72B tanks. Source of data in the table: MoD official statements & Belorusskaya voennaya gazeta in 2014-2017. The picture of modernisation looks, however, contradictory. Speaking to reporters on 28 November, Deputy Defence Minister for Armaments Siarhei Simanenka said as many as four T–72B, 30 GAZ-66 military trucks, and some other old Soviet era equipment had been successfully modernised. However, the refitting of military truck models from the 1960s, which had already proved highly vulnerable during the Soviet war in Afghanistan, raises questions about the rationality of such modernisation. The situation concerning Belarus’s heavy weapons is another story. Minsk is clearly not replacing most of its heavier, Soviet-inherited weapons. It decommisions them for further sales, like Su-27 heavy fighter jets or Su-24 bombers, or it simply does nothing about them as they grow older, like T-72 tanks. It is highly likely that the government is going to build a new army, which will not deploy these older heavy weapons. Indeed, in an article published on 3 November in Belarus Segodnya, the main Belarusian government daily, hinted at exactly such vision by declaring, “The main aim for the period until 2020 is to construct a compact, mobile, well-trained and well-equipped army.” In plain words, an army with only a minimum of heavy weapons. That is the direction in which Minsk is developing its military. The SOF seem to be serving as the model for the future national army. The special operations forces were established in the early 2000s and, according to Dzyanisenka, their composition and the scope of their responsibilities remain unchanged. SOF units have became a priority for the government and, therefore, they receive more new equipment than many other parts of the army. This year, the SOF received a trove of new equipment: Kaiman and Volat V-1 armoured vehicles designed and manufactured in Belarus, Chinese-made CS/VN3 Dragon armoured vehicles, the Belarusian-modernised BTR-70MB1 armoured personnel carrier, Russian-made P–7 parachute platforms for cargo, and Russian-made NONA M-1 120mm mortar. 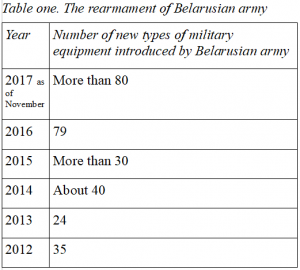 On the one hand, this list of new equipment for the SOF is larger than for any other part of the Belarusian armed forces, excluding air defence. In short, Minsk sees the SOF as its highest priority. On the other hand, it lends credence to the idea that Minsk wishes to build a smaller, yet more efficient fighting force, which can deal with Donbas- or Kosovo-like conflicts, but harbours no ambition of fighting a major war, say, with NATO. Minsk has little money and it has always tried to get funding for its military from Russia. Speculation about secret deals between Belarusian President Alexander Lukashenka and the Kremlin abound. And for good reason, too, as the case of a recently published agreement with Russia shows. The agreement concerns supplying a joint regional group of Belarusian and Russian troops. Minsk and Moscow signed the agreement on 2 November 2016 and it entered force on 14 November. Belarusian citizens learned about the document only post factum, last Friday. However, the terrible secret of that agreement turns out to be banal. The Kremlin essentially made clear that Minsk would only get free arms from Moscow in the case of full out war. Therefore, the Belarusian government’s attempts to arm itself without bearing too much of financial burden seem to have failed. Indeed, the appearance of such an agreement should be no surprise, because the Kremlin for some years has already stopped supplying its post-Soviet allies through CSTO mechanisms. Inhibited by the Kremlin’s staunch refusals to provide Belarus with heavy weapons, the Belarusian government adapted its policies. Minsk is now silently building a new army better suited to its limited needs and financial constraints. It is letting its Soviet-era, heavier arms be silently discarded without replacement—a huge fleet of T–72 tanks that have been neither modernised nor replaced provides an illustration. Simplification of existing army structures automatically follows, which also means a reduction of offensive capacities. 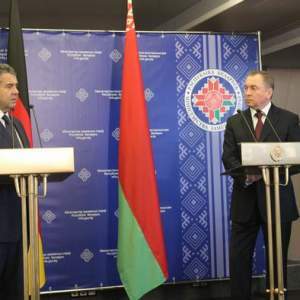 At a press conference on 17 November 2017 in Minsk, German Foreign Minister Sigmar Gabriel described his meeting with Belarusian President Alexander Lukashenka, in which they “talked a lot about Ukraine,” in positive terms. The upbeat summary is a remarkable surprise. On 15 November, Belarusian Foreign Minister Uladzimir Makey announced his country’s willingness to dispatch peacekeeping forces to Eastern Ukraine. In addition, for the first time, Russian Foreign Minister Sergei Lavrov voiced Russia’s support for the deployment of Belarusian peacekeepers, which Minsk has repeatedly proposed since 2014. Thus, Belarus appears to be on its way to secure the support of key international players for an active role in defusing the Ukrainian crisis. The deployment of peacekeepers in Eastern Ukraine offers Belarus a chance to raise its international status. Minsk finally accepted as a peacekeeper? Minsk has sought to play a peacemaking role in the Ukraine crisis for years now. A new window of opportunity emerged on 5 September when Russian President Vladimir Putin called for the deployment of UN peacekeeping forces in Eastern Ukraine. On 9 November, The Wall Street Journal reported that the US government—it did not specify what part—suggested the deployment of 20,000 peacekeepers in Eastern Ukraine because it believed Putin might be interested in ending the conflict. The Belarusian government is undoubtedly involved in horse trading over the Donbass region, home to Ukraine’s two separatist “republics.” On 17 October, President Lukashenka met with the director of Russia’s Foreign intelligence service (SVR), Sergei Naryshkin. Without any direct mention of Ukraine, official sources say their meeting dealt with the “coordination of activities and adjustment of directions of joint work aimed at protecting national interests.” These are serious grounds to assume that Lukashenka and Naryshkin discussed Ukraine. Indeed, as early as in October 2014, at the very beginning of the conflict in Eastern Ukraine, Lukashenka offered to send Belarusian peacekeepers to the Donbass region. Belarusian officials have continued to cautiously articulate the idea to no avail. As recently as October, the Kremlin still did not support the deployment of Belarusian peacekeepers to Ukraine. Certainly, the position of the most important party to the conflict—Ukraine itself—is unclear. First, Kommersant, a Russian daily newspaper, on 15 November quoted a source within the Ukrainian administration saying Kyiv would prefer Polish and Lithuanian peacekeepers. The same source continued to say that Russia would hardly welcome such an option. 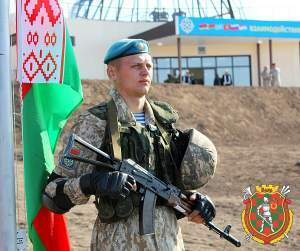 As a compromise, Kyiv might instead agree to Belarusian and Kazakh peacekeepers. 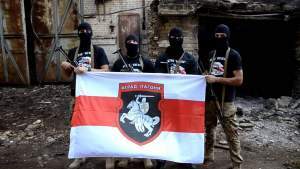 Another well–known representative of another Ukrainian right-wing party, Ihor Miroshnychenko, on 16 November said Belarus was an “enemy territory,” which has “common military interests” with Russia. He also urged Ukrainian diplomats to do everything to remove Belarus from the sphere of Russian influence. It would be somewhat self-defeating if Ukraine did, indeed, pursue such a disruptive policy. Belarus already persecutes citizens who support separatists in Eastern Ukraine. As recently as 16 November, a court in the southern Belarusian city of Rechytsa sentenced another Belarusian, Vitali Mitrafanau, on grounds of fighting for the self–proclaimed Donetsk People’s Republic in Eastern Ukraine. He had been detained by police in July. In September, a Vitebsk court in the north of Belarus convicted a Belarusian for the very same reason. The former was sentenced to two years of hard labour, the latter for two years of restricted freedoms. 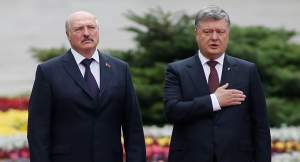 Many Ukrainian politicians speculate on Belarus’s role in the conflict. However, they often ignore the special circumstances that limit Belarus from taking a definite position. All the same, the Ukrainian government and Ukrainian President Petro Poroshenko so far have demonstrated a willingness to accept Minsk as a partner. However, powerful forces in and outside Ukraine work to sabotage Belarusian participation in the peace process. In addition to the calls of radical parliamentarians quoted above, other odd incidents occur regularly, which threaten to derail bilateral relations. On 25 October, for example, Minsk detained a Ukrainian citizen, Pavel Sharoiko, for espionage. Sharoiko is officially a journalist. 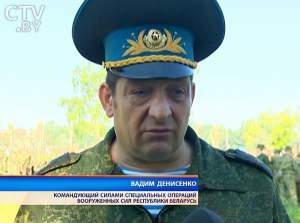 However, until 2009 he openly served with Ukrainian military intelligence. Belarusian authorities have tried to downplay the incident, keeping quiet on the issue until Ukrainian activists on 17 November revealed the story, which is now generating tensions between Minsk and Kyiv. Despite Russia’s hesitancy and Ukraine’s concerns, Minsk has shown its primary interest to bring it to an end the conflict in Eastern Ukraine. Indeed, Minsk has ignored other opportunities for joint military operations with the Kremlin. For instance, in recent years, international media have speculated on Belarus’s participation, together with other member states of Russia-dominated Collective Security Treaty Organisation (CSTO), in ensuring peace in Syria. However, that scenario has never materialised. On 27 October, the Belarusian Foreign Ministry announced there are no plans to discuss the sending of CSTO member state troops on a peacekeeping mission to Syria. Belarusian airborne troops. Image: Vayar news agency. In the 1990s, Russia also tried to convince Minsk to send Belarusian airborne troops as peacekeepers to Transnistria. Belarus did no such thing. 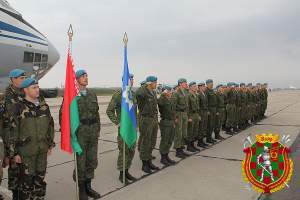 Its participation in peacekeeping operations has so far been limited to deploying a symbolic number of Belarusian military personnel as part of UN operations, in particular in Lebanon. Indeed, this is in stark contrast to many of Belarus’s neighbours, all of whom have participated in one international operation abroad or another. Since 2014, the Belarusian government’s offer of peacekeeping services to Ukraine has to do with the transformation of Belarus and its neighbourhood. Minsk wishes to find a new, international niche for itself through engaging in conflict resolutions. A central goal is to break out from the tired “last European dictatorship” epithet. At the same time, the volatility of the region has pushed Belarus along this course of action. Russian support is uncertain and increasingly limited. Thus, the Belarusian government has tried both to defuse at least some tensions around Ukraine and to gain more international respect. Until now, Minsk’s efforts to become more neutral have appeared problematic. Moscow, in general, has never appreciated these attempts. The West has been unsure of Belarusian claims of neutrality. However, if Belarus does deploy peacekeepers, then arguably Russia, the West and other neighbouring states would, in effect, be validating Belarus’s right not to choose sides.